I rarely order duck in restaurants because it’s usually tough and the skin is never crispy enough for me. Admittedly, I’ve tried many methods of cooking duck, but there is no easy way to get all the parts right. The method I’ll describe for you today offers the best of all duck worlds–but it doesn’t come easy. 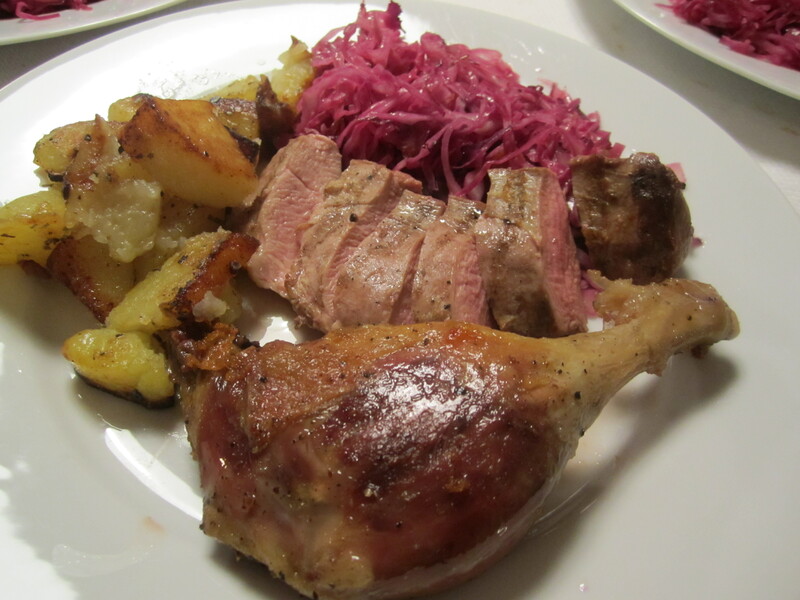 I should begin by stating that I make duck only on rare occasions, but when I do make it, I am always deeply gratified. The reason for this is that duck is one of those animals (like pig) that provides so much useful raw material that it’s a shame to throw away any part of it. 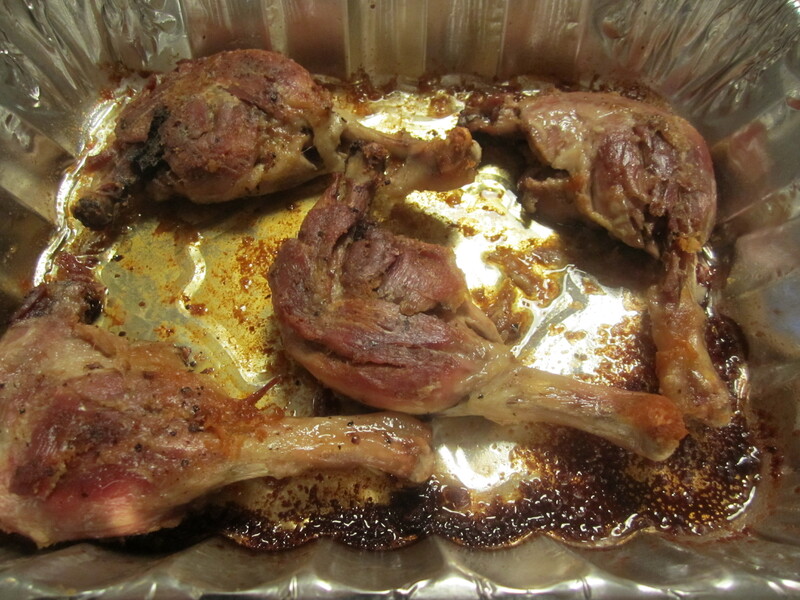 Maximum use of a duck entails removing the legs and slow-cooking them; removing the breast and quick-cooking it (on the grill). You are then left with a carcass (for irrestistible stock), and a couple of pounds of skin and glorious fat. I like to dice the skin and fat (time-consuming but cathartic), place it in a pan covered with water, and slowly render it. What you are left with is a pot of golden duck fat– perfect in which to fry potatoes (or just about anything else). Additionally, you’re left with a pile of sublimely delicious cracklings–perfect to shower with salt and put on a salad of bitter greens. Because I can’t seem to cook a duck without doing all of the above, I save it for a day when I have the entire afternoon to devote to my duck–like today. I’m having a group of friends for dinner, one of whom maintains that she has never eaten any duck other than mine–so I decided to surprise her. Be prepared for a mess in your kitchen, and have a bottle of sprayable bleach at the ready to wipe down everything in the kitchen after you’re done with the handling of all the raw parts. Remove the legs with a combination of scissors and knife. 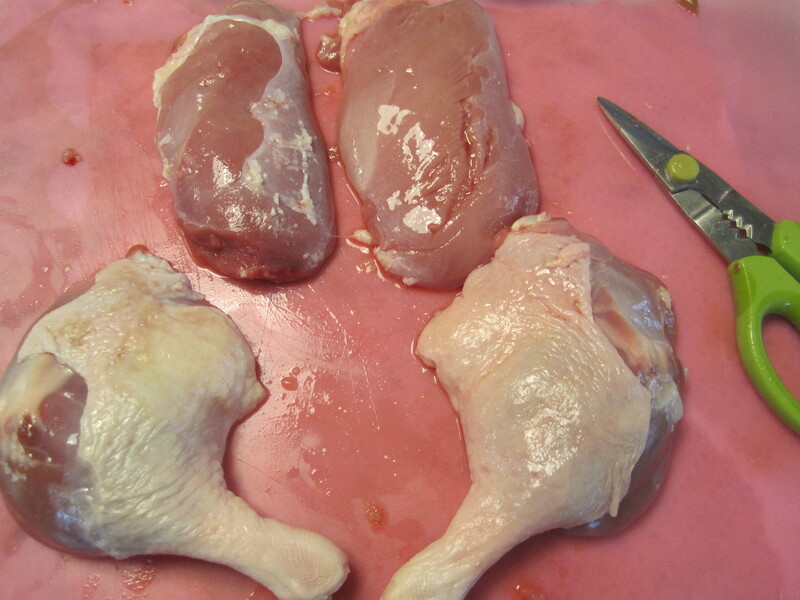 Pull off any thick fat from around the thighs and reserve for the rendering process. Next, remove the breasts by slicing along the breastbone on both sides of each breast. Then gently pull off the skin and reserve. 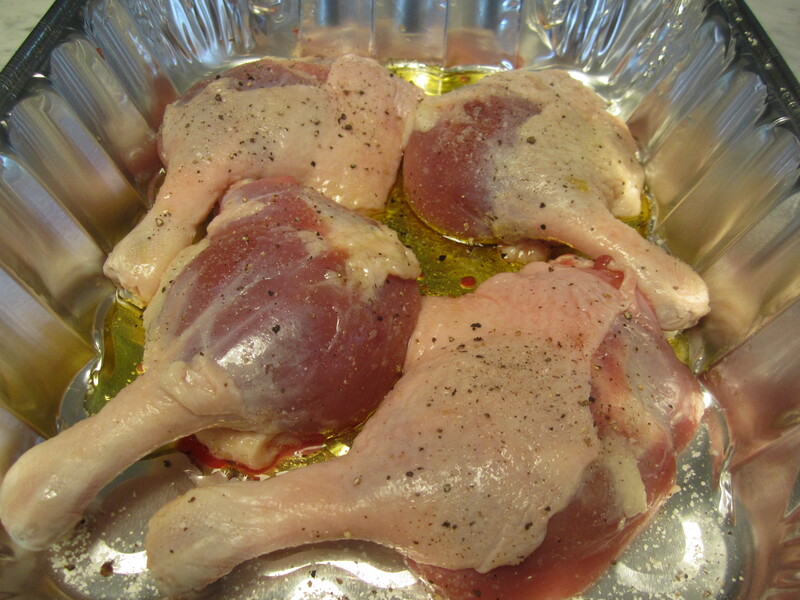 Pull off any thick excess fat from around thighs and arrange thighs in a roasting pan. Season liberally with salt and pepper and cover with foil. 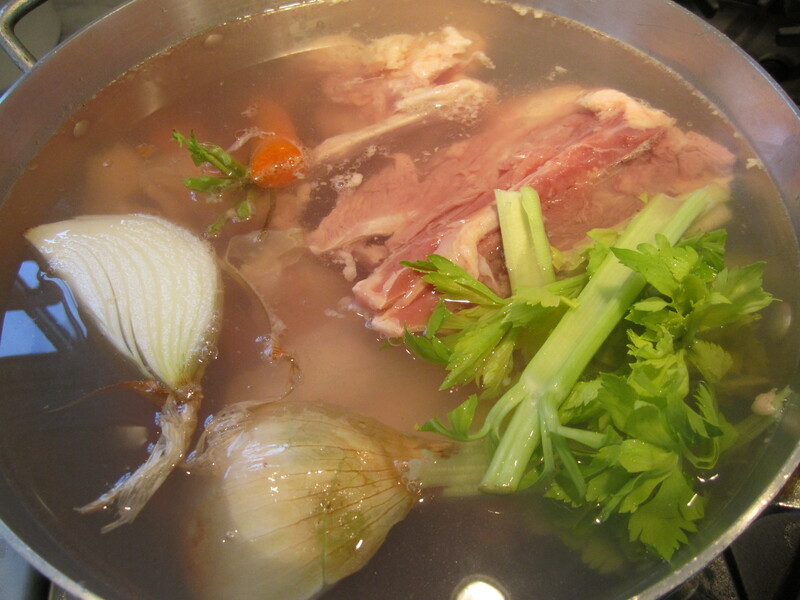 To make the stock, simply place carcasses and necks (if you have them) in a large stockpot and fill with water, a large onion, a carrot, and some celery. Simmer for an hour-and-a-half, removing scum and fat from the surface of the water. Add salt or a couple of bouillon cubes, then cool and refrigerate or freeze for later use. 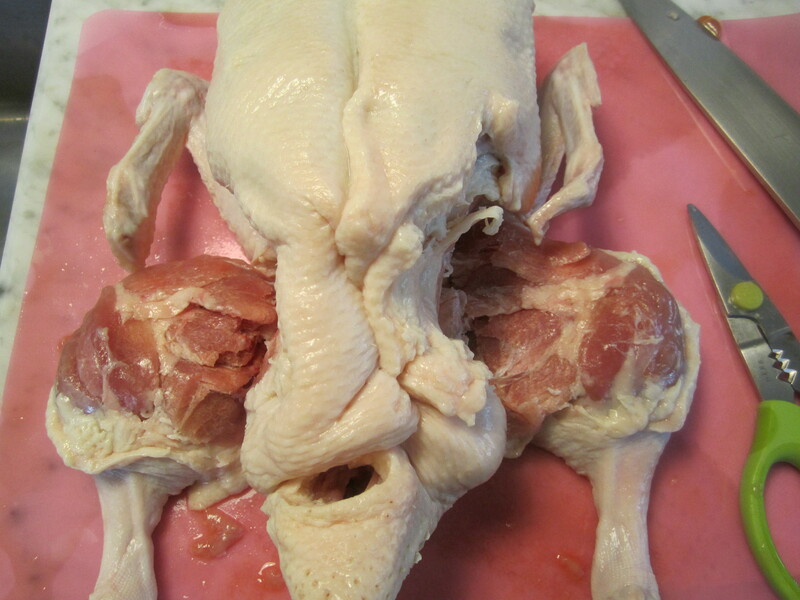 Next, to render the fat from the skin, take all of the skin and fat, and cut into 1″ or 2″ pieces. This requires slow movement with a very sharp knife, slicing back and forth. 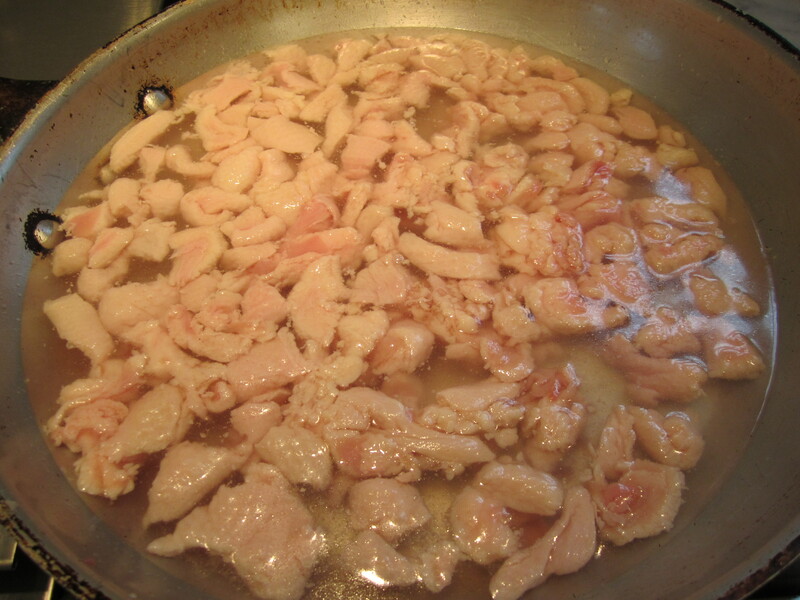 Place all skin in a skillet and cover with water. On low heat, slowly simmer uncovered until there is no more water remaining–only shrunken pieces of skin and golden duck fat. This can take about a half-hour or so. Pour off the golden liquid through a cheesecloth-lined strainer and reserve the fat for frying potatoes. Place the bits of skin in a smaller nonstick skillet and continue rendering them until golden and crispy. Shower with salt and scatter over a salad (or anything else you want). About an hour-and-a-half before dinner, place the covered tray of leg/thighs on a covered grill (or in a 350-degree oven) and roast until golden and crispy. Turn halfway through. To make the breasts, simply season with salt and pepper and grill on high heat for about 4 minutes per side. Let rest for about 5 minutes, then slice and serve alongside the legs. Incidentally, a great sauce (served on the side) for this dish is the barbecue sauce from my Barbecued Spareribs post. Serve with skillet potatoes, substituting duck fat for olive oil. Also, a nice warm red cabbage and bacon salad. 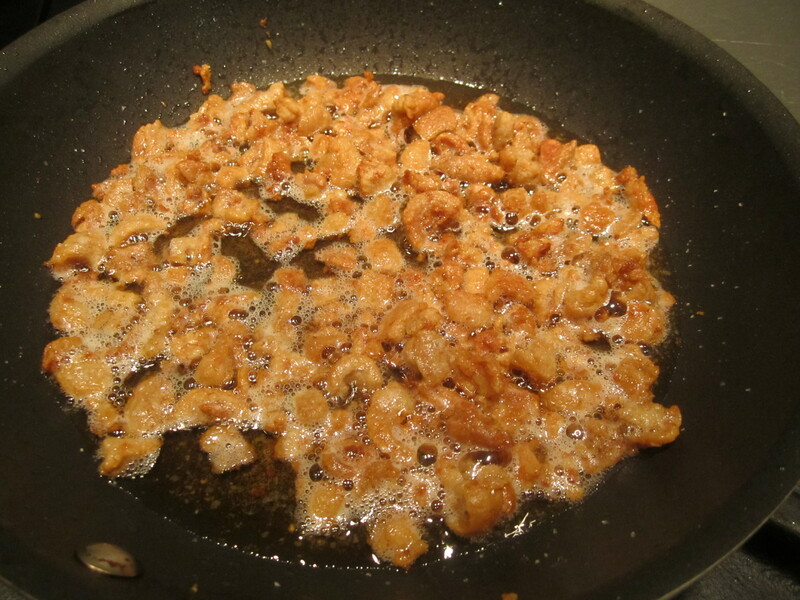 As a separate course, serve a salad with crispy cracklings.